An investigation by the Maryland Drivers Alliance revealed that Montgomery County's speed camera program issued several erroneous citations in recent months by issuing them to the wrong vehicle. Meanwhile, Montgomery County's “Local Designee” failed to identify another confirmed erroneous citation and has so far refused to answer questions by the Maryland Drivers Alliance about the nature of this error. Evidence of the errors was uncovered in a Maryland Public Information Act Request which the editor of the Maryland Drivers Allegiance website filed with the county on April 17. 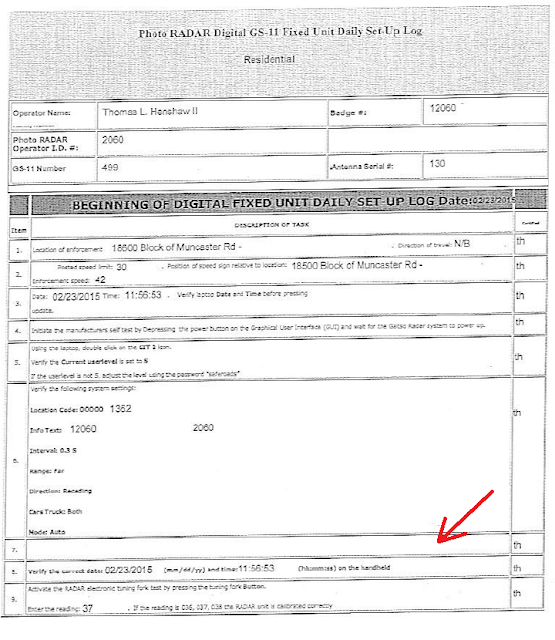 Included in the disclosed documents were several examples of acknowledged erroneous citations which Montgomery County issued between January and April of this year. One motorist from Columbia wrote about a citation issued on Dufief Mill Road, where a small sedan had been mistaken for their SUV: “I only own a Black 2015 Ford Explorer, it seems the car in the picture is a Ford Focus or similar vehicle”. A motorist from Parksville wrote “Please look at the vehicle in the photo, It appears to be maybe a blue or grey car maybe a Camry or something like that.”. The motorist stated that their car was a bright Orange Prius, thus looked nothing like the vehicle in the image. Another motorist, whose complaint to the Maryland Drivers Alliance prompted our investigation, had received a citation dated March 20 2015 located at 10700 block of River Rd eastbound. 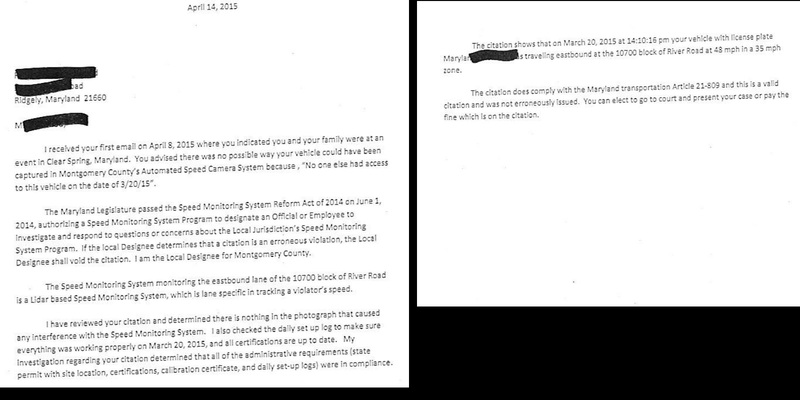 The motorist had written to Montgomery County's “Local Designee” asserting that it was impossible for her vehicle to have been in Montgomery County on that date. However in this instance, Local Designee David McBain rejected her appeal. (In addition to being the "local designee", McBain is the Deputy Directory for the Traffic Division and second in command over the speed camera program after Captain Tom Didone, and thus has managerial responsibilities in the speed camera program). However a few days later, the motorist received a void letter from Montgomery County which was dated four days BEFORE the local designee's response (presumably initiated by the county's contractor). “After further review, it has been determined that the citation should be administratively voided due to a processing error.” stated the void letter dated April 10. In fact the vehicle shown on the image was NOT in Montgomery County on March 20, 2015. The recipient had multiple forms of evidence showing this could not be the case, and also noted to us that the weather shown in the image did not match the weather conditions on March 20. 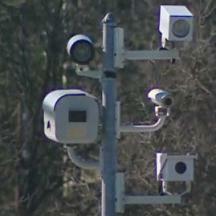 The Maryland Drivers Alliance surmised that the speed camera might have been improperly configured with the wrong date, and wished to determine whether there might have been other “processing errors”. 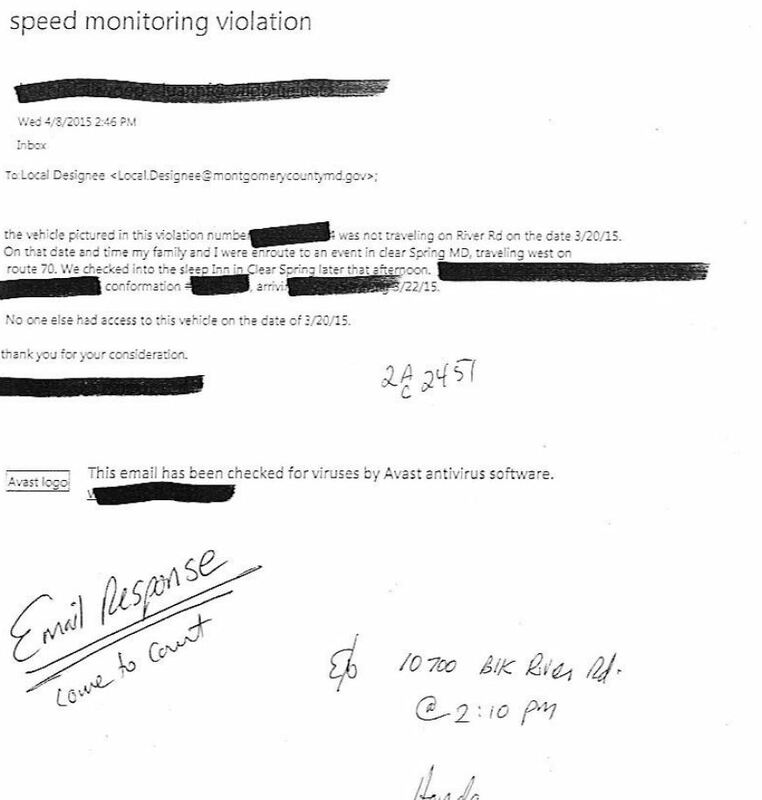 We wrote to the “local designee' on April 23rd asking “whether you have investigated whether other citations issued from this speed camera dated between 3/19/2015 and 4/1/2015 may have contained erroneous information. If not, I request that you please investigate whether this device was improperly configured during some portion of this time period.” and requesting that if other “processing errors” existed that they be voided as well. We also asked that the nature of the “processing error” be explained. We received no immediate response, and prompted the county again on May 5. On May 6 Local Designee David McBain replied in an email “I will be responding to you tomorrow in the hopes that it will satisfy your request. ”. However we still received no response to our questions on May 7th.. On May 15, we received an email from the county stating that both our MPIA would be answered the next day, but there was no answer to tee questions we had asked the Local Designee. The following week we received the response to our MPIA. The documents did contain documents confirming that the designee had received the particular motorist's complaint, that an email from the “local designee” rejected the appeal AFTER the date on the void letter had been sent, and that the void letter was dated before the Local Designee's response. However the response did NOT include an answer to our questions as to whether the local designee had investigated whether there might have been other “processing errors' from the camera located at 10700 Blk of River Road eastbound at the end of March. After examining the documents and giving the county some additional time to answer the questions, we we repeated our questions to the local designee on June 5. The Maryland Drivers Alliance has yet to receive answers to our questions about this "Processing Error". “Ombudsman” Denied Defendant's Request for Discovery of Records. Documents received from the county also show that the County's Local Designee denied a request for records made by a ticket recipient. The motorist wrote in an email "If it is in the government's decision to move forward in this matter, I would request copies of any evidence the prosecution may have of my involvement in the "offense", and also asked for all maintenance records for the camera(s) involved." One motorist requested. Whether or not discovery is explicitly required by the constitution is irrelevant because the MPIA requires you provide a person in interest with access to records. I refer to the Section 4 paragraph 1 of the MPIA manual on the OAG website: "A request expressing a desire to inspect or copy agency records may be sufficient to trigger the PIA’s requirements, even if it does not expressly mention the words “Public Information Act” or cite the applicable sections of the State Government Article." and "An agency need not and should not demand written requests for inspection of agency documents when there is no question that the public has a right to inspect them. " Moreover, FAIRNESS requires that a person is entitled to obtain records that would be used in a case against them. The constitution might specify some BARE MINIMUM amount of rights the state can ever provide to a defendant under the law under any circumstances, but in Maryland the MPIA provides additional rights to a person in interest. Furthermore, fairness demands that the county not withhold information from a defendant regardless of whether this is more than the bare minimum rights of discovery the constitution requires. The Maryland Drivers Alliance awaits a response to our complaint. The Local Designee received several other complaints, some of which alleged speed measurement errors. 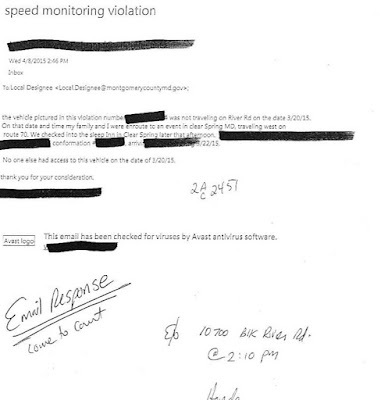 The Designee denied every single instance of a speed measurement error. The documents provided in response contain insufficient information for us to evaluate the individual complaints. In several cases, the designee was presented with a “time distance calculation” asserting that the speed measurement was in error. In one case McBain “I received your email where you were attempting to calculate a time-distance formula from the photographs that are provided in the citation. Based on you calculations you believe you were erroneously issued an automated speed citation. “ McBain then asserted that the only purpose of reviewing citation images was to confirmed that parked vehicles had not been ticketed. ”Vehicle Progression is the only thing that can be accurately detected when reviewing two photos and is to sufficient to prevent parked vehicles from receiving speeding citations when a proper review is being conducted”. In this instance, McBain then proceeded to assert the citation was valid without presenting a time-distance calculation of his own. However in another case, a motorist presented a time distance calculation based on the information on the citation, which showed a timestamp that had been rounded off to the second, thus not providing the accurate time interval. In that case the local designee presented his OWN calculation, based on the time interval the device had recorded but which the county deliberately excludes from citations, for the purpose of REFUTING the calculation. "Utilizing the formulat D/T then converting FPS to MPH we can Verify the speed your vehicle was travelling. As such: 14.961/0.239=65.598 FPS; 65.598x0.681818=42.680mph" wrote Traffic Department Deputy Director and Local Designee David McBain when and only when it suited the county's purpose for math to be used to verify speed. We previously reported that training documents created by Montgomery County's speed camera contractor, Xerox, demonstrated the use of time-distance calculations for the purpose of VERIFYING speed, not just determining whether a vehicle was stationary or not. Those errors included stationary vehicles receiving citations, but also other errors where a vehicles were proven and admitted to have been cited for going much faster than their actual speed while they were still in fact moving. Local governments, particularly Montgomery County, STRONGLY opposed any changes to the law which would have required citations to contain enough information to allow verification of speed. In another case, the Local Designee stated that the presence of another vehicle directly adjacent to the car did not constitute a possible cause of “Radar Effects”. Radar extends out in a “cone” shape, and cannot distinguish the speeds of different vehicles directly next to each other. In another case, McBain stated that there was no indication of anything which could cause “radar effects” in the image. It is unclear how this determination could be made with certainty in a case such as that one where the images were taken at night, and objects that might have cause interference were not illuminated. Baltimore City's speed camera program was shut down after the city and their contractor (Xerox) were forced to admit that "radar effects" (using Xerox's term) had caused speed measurement errors. Xerox is also the vendor for Montgomery County. Independent reviews and audits performed in Baltimore have since revealed that such errors were widespread, and also that inappropriate practices were followed in issuing contracting. Montgomery County strongly opposed any changes to the law which would have created independent audits or outside oversight of the sort which have taken place in Baltimore since the time of the admitted errors. Which showed that the “operator” “Signed” a step which was BLANK. 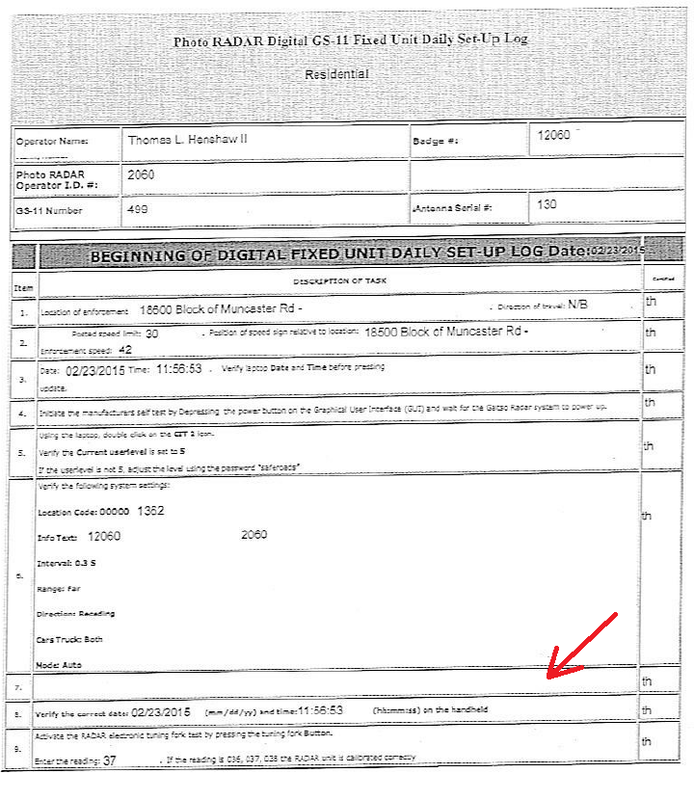 In every instance where such a defect existed in the log, the “local designee” did not consider it to be "invalid" that either the log does not accurate representation of the procedure being signed for, or else that camera “operators” are systematically signing for a step which was not performed. There is no indication that defendants who requested review were provided copies of the logs so that they might have spotted the defect themselves prior to a court hearing so that they might use that information to prepare their defense. Have you received an erroneous citation, an inadequate response from a "Local Designee", or did you receive a citation from a speed camera located at 10700 Blk River Rd e/b between March 19 and March 31 which might have contained an error? If so, please assist our investigation by CONTACTING US.